California Bows Before CAI Racism! No Comments on California Bows Before CAI Racism! This one is so amazing it’s not even amazing! I would even go so far as to call the California Legislature racist! 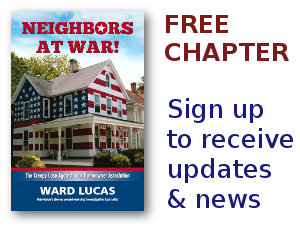 Assembly Member Donald Wagner introduced a bill to make the state’s Open Meetings law apply to the boards of Homeowners Associations. The CAI and its minions of lawyers and lobbyists descended on the Legislature like flies on a carcass. Only one member of the Housing Committee voted in favor of allowing homeowners to know what their boards were doing. California has many homeowners whose English-speaking skills are limited. Under current California law, you’re not even allowed to bring an interpreter or representative to a board meeting. Rich People Have More Rights! No Comments on Rich People Have More Rights! It’s ugly to say it, but rich people really do think their rights are superior. At least, that’s what it looks like in drought-ridden Southern California. The entire southwest is facing one of the worst droughts in its history. Yet members of the Blackhawk Homeowners Association have been told to green up their lawns…or else! There are new state laws that prohibit California HOAs from fining residents who have brown lawns. But do you honestly think the average Homeowners Association has any respect for state law?